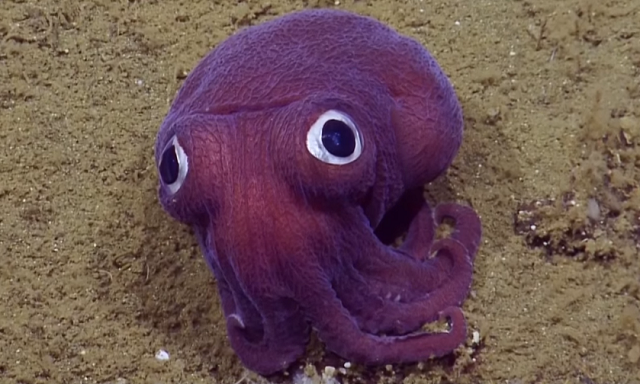 Researchers aboard the Exploration Vessel (E/V) Nautilus came across a purple 'googly-eyed' squid on the seafloor while exploring the ocean depths off the coast of California. The video of the Stubby Squid (Rossia pacifica) was taken at a depth of 900 meters (2,950 feet) below the ocean's surface. Scientists say that the Stubby Squid looks like a cross between an octopus and squid, but is more closely related to cuttlefish. According to researchers, this cephalopod species spends life on the seafloor, activating a sticky mucus jacket and burrowing into the sediment for camouflage - leaving only their eyes poking out to spot prey like shrimp and small fish. Rossia pacifica is found in the Northern Pacific from Japan to Southern California up to 300 meters (980 feet). But in addition to the sighting by the Nautilus team, researchers at the Monterey Bay Aquarium Research Institute have spotted these invertebrates at depths of 1,300 meters (4,260 feet).